Financial adviser Karl Deeter told the conference his research puts the non-engagement rate at closer to 80 per cent. 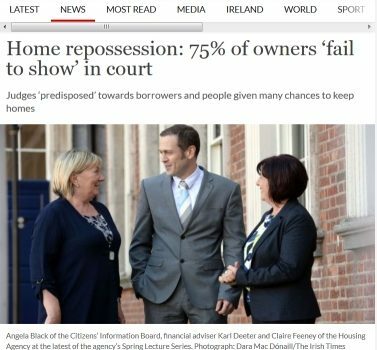 Mr Deeter said the courts are “predisposed” towards borrowers, and that people are given many chances before they lose their homes. “There’s three magic rules if you want to lose your home: pay zero for a long period of time, don’t engage with your lender – and then don’t show up to court,” he said. Mr Deeter said that according to his research, more than 90 per cent of distressed borrowers who engaged with their lender were able to work out some sort of deal to avoid repossession. The Central Bank published the quarterly mortgage arrears figures today, here are the key findings (taken from their press release). The number of mortgage accounts for principal dwelling houses (PDH) in arrears fell further in the third quarter of 2016; this marks the thirteenth consecutive quarter of decline. A total of 79,562 (11 per cent) of accounts were in arrears at end-Q3, a decline of 3.1 per cent relative to Q2 2016. The number of accounts in arrears over 90 days at end-September was 56,350 (8 per cent of total), reflecting a quarter-on-quarter decline of 2.1 per cent. This represents the twelfth consecutive decline in the number of PDH accounts in arrears over 90 days. The majority of maturity categories of arrears, including the over 720 days’ category, declined in Q3 2016. This category recorded a fifth consecutive decline, having declined for the first time in Q3 2015. 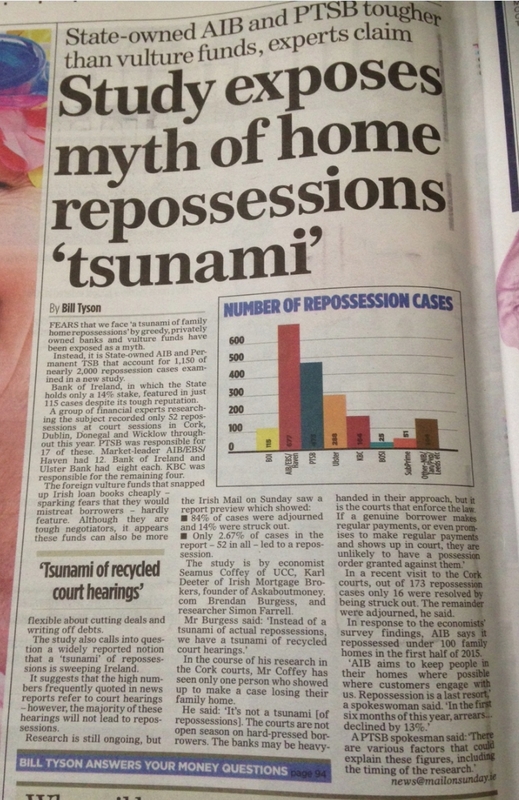 There has been an ongoing commentary about ‘Tsunami’s’ of repossessions that are occurring right now or just about to and we have been part of what we feel is a more realistic interpretation of the facts. Yes, people have lost their homes and more will, that is always part of the outcome after a massive financial crisis, one of the largest ever, and in a nation that set records for the size and scope of their financial problems. To think it could be any other way is the same as expecting a health system where nobody ever dies irrespective of the problems they may have. 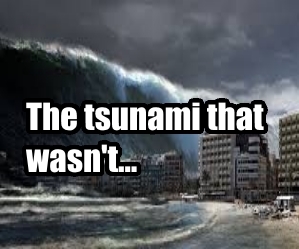 That kind of belief is not rooted in reality. We think that the correct response is rapid and fair intervention where warranted, and zero protections where properties are abandoned and no payments are being made. Within this vista there are those who would have you believe the world is being torn asunder and nobody is doing anything about it. Here are some of the statistics from the courts covering the first quarter of 2016. Below is an email excerpt from the Central Bank on the area of court proceedings. We get frustrated with misinformation about stadiums of people doomed to homelessness and sums up around 20,000 court proceedings being bandied about. They are bad numbers and should be ignored, however, it doesn’t stop people from repeating things that are wrong. There is also the information (not yet public as far as I know) from the Court Service which indicates the live number of cases in the system at the end of the same period was 12,252 again, nowhere near some of the figures that were being trumped about at the time. This was a joint opinion piece by Karl Deeter of Irish Mortgage Brokers and Ross Maguire of New Beginning. Ross is a Senior Counsel and a highly skilled professional in the area of property rights. The point being raised was that property rights and contractual obligations are very well set out in Irish law. There are those that would have you believe that a person or company can buy your loan and suddenly turf you out, that simply isn’t the case and is factually incorrect. 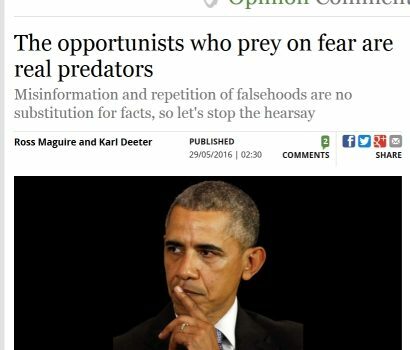 We refer to people sending out that kind of nonsense as being mandarins in the ‘Ministry of Fear’ and make the point that the facts matter. This clip is a good insight into the many facets of the housing debate when looking at the ‘crisis’ end of the spectrum. It raised some interesting issues and commentary. 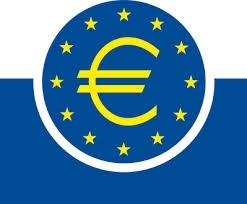 One thing we want to state is that there was an implication that if a fund bought your mortgage that you might be able to get thrown out rapidly, we should state clearly that this simply isn’t the case and is likely a misinterpretation of fact than a stance which is there to deliberately mislead. 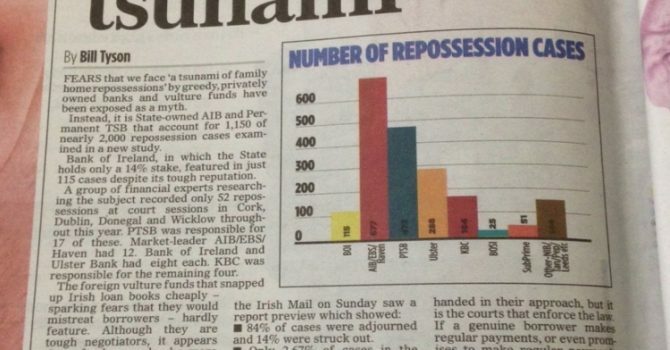 Bill Tyson was writing in the Mail on Sunday and highlighted some of the research we have helped to carry out on the courts around Ireland when it comes to documenting repossessions. We were pleased to see this get coverage that wasn’t driven by emotive bylines and rather considered the facts as presented. In court data gathering formed the basis of an article by Karl Deeter, Brendan Burgess (askaboutmoney.com) and Seamus Coffey (Economics lecturer UCC) which was discussed on Primetime. It was an interesting insight into the results of almost 300 possession hearings in various circuit courts around Ireland.